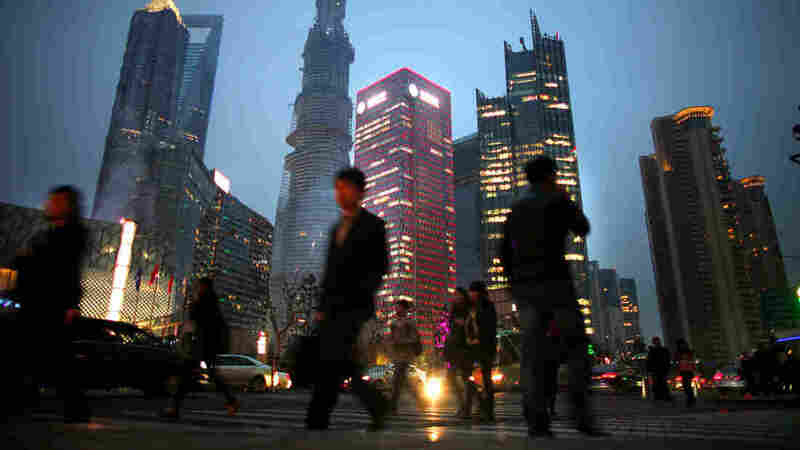 Global Survey: China Will Surpass U.S. As Leading Superpower : Parallels The survey by the Pew Research Center reflects China's growing economic might. However, most respondents say they still view the U.S. more favorably than China. In a global survey, many respondents believe that China has overtaken or eventually will overtake the U.S. as the world's leading superpower. Chinese are shown here walking in Shanghai's financial district in March. China has supplanted or soon will supplant the U.S. as the world's leading superpower. That's the headline from a survey by the Pew Research Center, which put this proposition to people around the world. In 23 of the 39 countries surveyed, majorities or pluralities said China has overtaken or will overtake America. In China, the verdict was clear: Two-thirds believe their country already has supplanted or eventually will supplant America. In the U.S., about half the country believes America will continue to be a greater economic and political force than China. But the number is down from 54 percent in 2008 to 47 percent today, the survey found. The survey reflects China's dramatic rise as a global economic power over the past three decades, and economic turmoil in the U.S. in recent years. "China's economic power is on the rise, and many think it will eventually supplant the United States as the world's dominant superpower," the report says. However, those surveyed still had a more favorable view of the U.S. compared with China, with 63 percent having a positive view of America, compared with 50 percent for China. The U.S. was viewed more positively in every region in the world except the Middle East — where only 1 in 5 respondents had a favorable view of America. Several places that are leading recipients of U.S. assistance had the most negative views of America: Pakistan, Egypt, Jordan and the Palestinian territories all receive large amounts of U.S. aid. But only 11 percent to 16 percent of respondents in those countries had a favorable view of America. It's worth noting that these global perceptions can be subject to rather dramatic shifts. Roughly two decades ago, Japan's economy was surging, and there was widespread talk that it could overtake the U.S. as the world's most important economy. Japan's economic bubble then popped. It has never fully recovered. Pew, which is based in Washington, surveyed nearly 38,000 people in 39 countries in March and April. What do you think? Send your comments to Parallels.